In early 1981, women around the world swooned when Charles, Prince of Wales proposed to Lady Diana Spencer with a stunning sapphire engagement ring. The ring featured an oval blue sapphire surrounded by diamonds in an 18-karat white gold setting. But Diana wasn't the first royal woman to wear a famous sapphire engagement ring, nor was she the last. 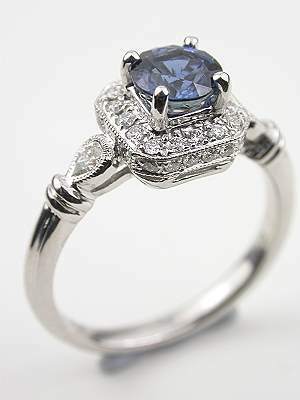 This regal antique style sapphire engagement ring blends breathtaking color with diamond shimmer. 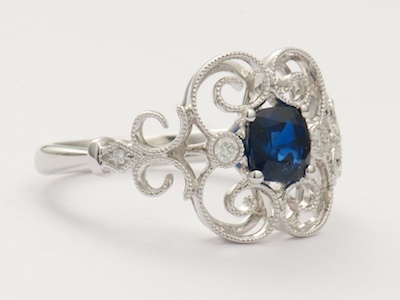 The highlight of this antique style engagement ring is the vibrant blue sapphire at the center. A pair of round brilliant cut diamonds flanks this gemstone. An additional forty-four round full cut diamonds cascade down the shoulders of the 18k white gold band.This is a new sapphire engagement ring in the antique style. The glorious colors of fall accent this romantic Topazery Earth Collection antique style engagement ring. 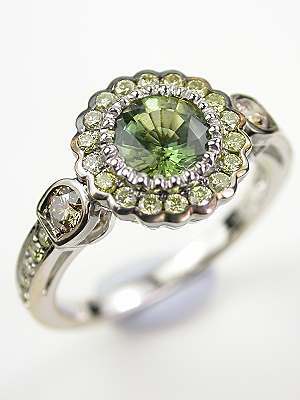 Fancy colored diamonds accent the bezel and shoulders while a yellow green sapphire mesmerizes at the center. A black rhodium finish adds depth to the 18k white gold mounting. This is a (new) antique style engagement ring. 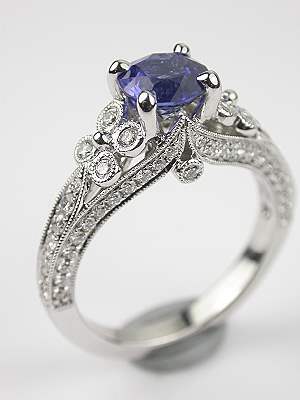 The domed spider web setting of this Art Deco sapphire antique engagement ring casts an alluring spell. The platinum band of this Art Deco antique sapphire engagement ring is a stunning combination of pierced angular cutouts and textured Xs and fronds. Tucked amidst this spellbinding display are eighteen full and single cut diamonds. The cupola top setting captures a 0.97-carat round blue sapphire in its center. Circa 1920. 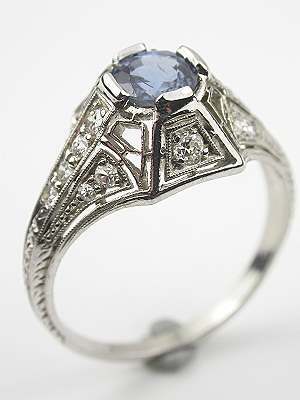 The focal point of this vintage engagement ring is a round faceted mixed cut blue sapphire. Weighing 1.10 carats, the centerpiece gemstone of this vintage engagement ring is flanked by two square French cut diamonds that total 0.23 carats of diamond weight. A platinum setting compliments this vintage engagement ring's exquisite details. Circa 1935. 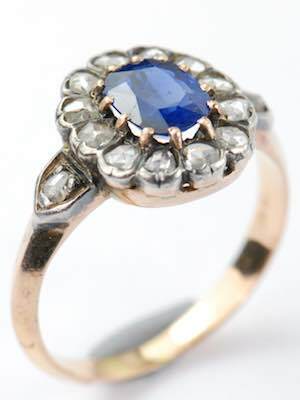 The romance of a tropical island honeymoon is captured in antique style sapphire engagement rings like this one. A collection of six pear brilliant cut diamonds are petal arranged at the shoulders of the 18k white gold band of this antique style engagement ring. An additional twenty round brilliant cut diamonds highlight them in a chevron array. Set in the middle of all this sparkle is a round blue sapphire. 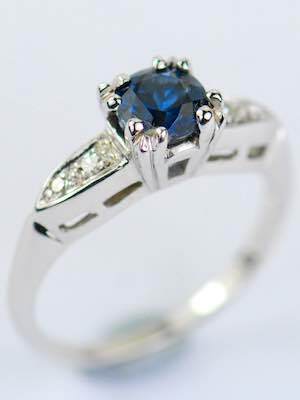 This is a new sapphire engagement ring in the antique style. A timeless mounting lends classic sophistication to a stunning blue sapphire in this vintage style engagement ring. The natural blue sapphire that highlights this engagement ring is set in a square diamond-accented cushion. The top and shoulders of the 18k white gold band shimmer with thirty-two round brilliant and two pear brilliant diamonds respectively. And, a clover leaf design on the under bezel adds good luck! This is avintage style (new) engagement ring. The green sapphire in this vintage engagement ring radiates with the crispness and freshness of a spring morning. Four round single cut diamonds on the engagement ring drip down the shoulders like daybreak dew. The matching platinum wedding band is East/West set with eight single cut diamonds that lend a burst of sparkle to the finger. Details: Platinum. Single cut diamond; 0.58 carats. Sapphire; 0.75 carats. Circa 1930s or later. Paisley swirls of filigree flirt with diamonds in this vintage style engagement ring with a natural blue sapphire. 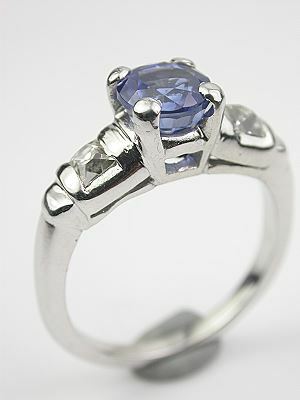 The blue sapphire is prong set above two hearts on the under bezel of this 18k white gold engagement ring. The band has a paisley filigree design with diamonds. 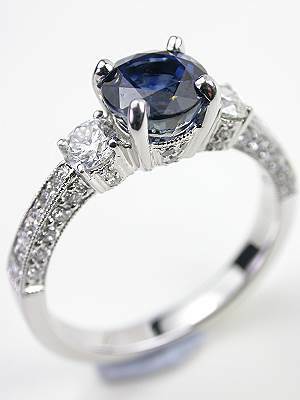 This is a (new) vintage style sapphire engagement ring. 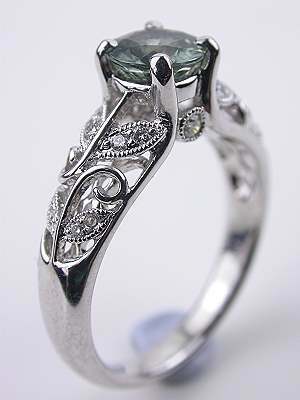 Climbing vines and rose buds ascend to a bluish green sapphire in this antique style engagement ring. An engagement ring with a floral and leaf pattern in 18k white gold romantically wraps the finger. The leaves and bezel are set with eighteen round brilliant cut diamonds, totaling 0.18 carats. 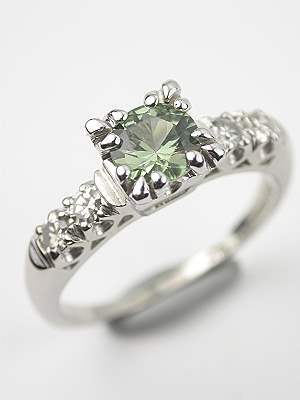 This is a new green sapphire engagement ring in the antique style. 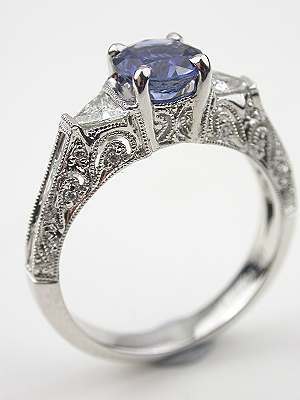 Dramatic color and unusual elegance come together in this vintage style blue sapphire engagement ring. The 18k white gold band of this engagement ring is set along the shoulders and shank with a collection of seventy-four round brilliant cut diamonds that total 0.52 carats. Eight of these diamonds, four on each side, are arranged in a floral design. The diamond flowers flank a bewitching blue sapphire at the center. 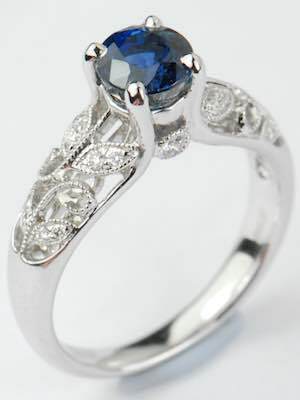 This is a vintage style (new) blue sapphire engagement ring. A bluebird flashes across winter's icy landscape in this vintage style engagement ring with sapphire. Diamonds cluster into a trio of hearts at the topsetting of the engagement ring. The hearts romantically hug the ring's centerpiece blue sapphire. Additional diamonds flank the sapphire and drizzle down the white gold shoulders. The cool combination of blues, whites lends hints of winter. Details: Vintage style. 18k white gold. Round brilliant cut diamonds; 0.83 carats. Round blue sapphire; 1.71 carats. 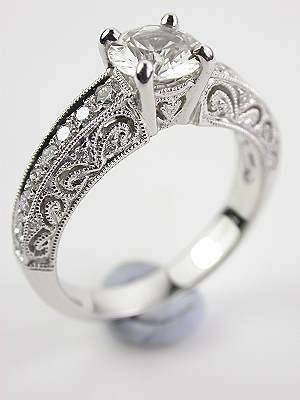 Paisley swirls of filigree flirt with diamonds in this engagement ring with white sapphire. A white sapphire is prong set above two hearts on the under bezel of this pierced and engraved vintage style engagement ring. An elaborate filigree design glitters with diamonds. Matching wedding bands are available for separate purchase. Details: Vintage Style (new). 18k white gold. Round full cut diamonds; 0.30 carats. Round white sapphire. Diamond petals flutter about the shank and shoulders of this garden-inspired sapphire engagement ring. Like petals dancing in a summer breeze, this vintage style engagement ring sets the warmth and beauty of a flower garden into motion. 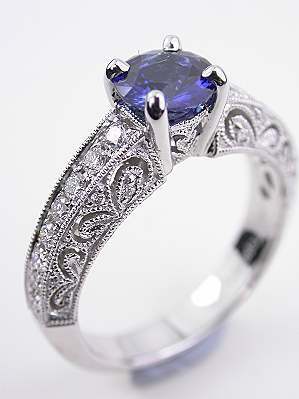 A violet-blue sapphire rises from the center of the 18k white gold band. Mille grain adds a splash of texture. Details: Vintage style. New. 18k white gold. Full cut diamonds; 0.11 carats. Round faceted mixed cut sapphire; 1.41 carats. 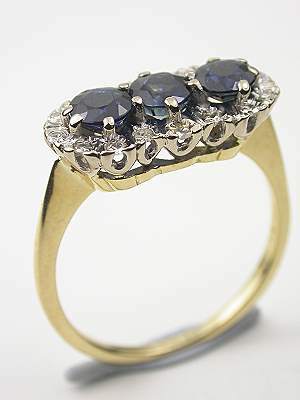 Round single cut diamonds flirt with a deep blue sapphire in this 1930s vintage engagement ring. Bluer than the bluest summer sky, the sapphire that rises from the center of this 1930s engagement ring mesmerizes. It is flanked by a pair of round single cut diamonds at each side. The 14k white gold band in which it is set is highly polished. 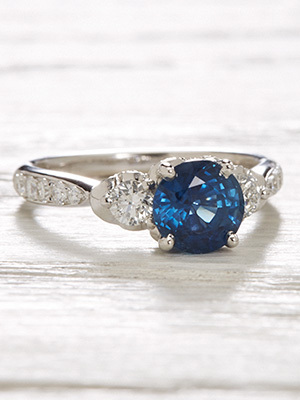 Sapphire engagement rings like this one give brides color, sparkle and shine. Details: Vintage. Circa 1930s. 14k white gold. Round single cut diamonds; 0.05 carats. Round sapphire; 0.71 carats. Blue and white teams up with filigree to create an architecturally inspired design in this vintage style sapphire engagement ring. A trio of diamond shapes creates an icy shimmer around a blue sapphire in this vintage style engagement ring. Trillion cut diamonds on the shoulders point to baguette cut diamonds on the shank. In addition, round cut diamonds create a glittering display around the filigreed paisley swirls. 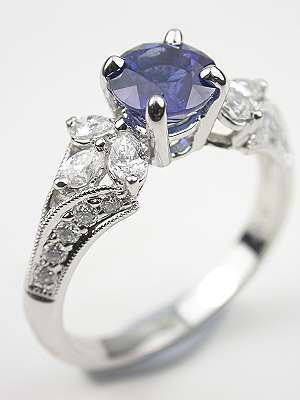 This is a (new) vintage style sapphire engagement ring. 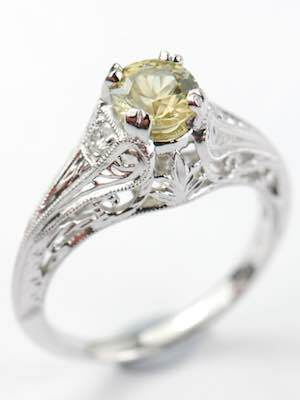 A magnificent yellow sapphire glows with the warmth of the sun in this vintage style engagement ring. The pierced and carved band of this Edwardian inspired engagement ring combines a playful collection of swirls, milgraining and fleurs de lis. Ascending from the center of this metallic display is a stunning yellow sapphire. A pair of diamond accents flirts with the sapphire at the shoulders. Details: Vintage style. New. 18k white gold. Round brilliant cut diamonds; 0.11 carats. Round yellow sapphire; 0.92 carats. More recently, Princess Diana's ring once again made history when her son, William, presented it to his fiancee, Kate Middleton, upon their engagement in October 2010. As they've done for centuries, royals often set trends, and these famous pieces of jewelry open up numerous possibilities for contemporary brides who favor vintage or antique sapphire engagement rings. The word sapphire derives from two words: the Latin sapphirus, and the Greek sappheiros, both of which translate to "blue stone." Sapphires have a long and storied history, dating back at least to ancient Rome and Greece, where they were thought to protect their owners from harm. In the Middle Ages, clergy wore sapphires to symbolize heaven. The stones have many other virtues attributed to them--romance, peace, wisdom, chastity--all of which make them both a powerful and beautiful choice for an engagement ring. If your faith is an important part of your wedding vows, then an antique sapphire engagement ring lends a bit of a Christian touch to your ceremony. In the Bible, Revelation 21:19, in describing a new heaven and a new earth, cites the sapphire as the second foundational stone. In addition, Ezekiel 10:1 describes the throne of God as being like a sapphire in appearance. 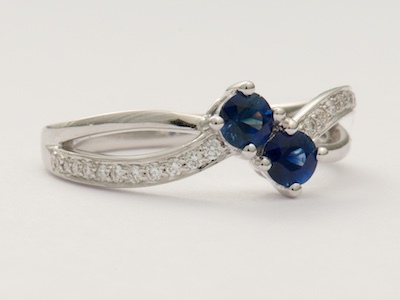 Blue is the most popular color choice for a sapphire ring. However, sapphires are available in a veritable rainbow of colors, from yellow, to green, to pink, and even black. Our sapphire engagement ring collection includes sapphire rings with exquisite touches such as diamond accents, lacy filigree, and fishtail designs. Round, cushion, and emerald cut sapphires are all well represented. Delicate or bold, understated or stunning, simple or fancy, you'll find a spectacular sapphire ring to suit your personal style. 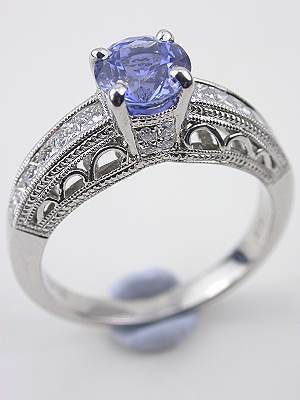 We offer antique, vintage, and antique style (new) sapphire rings. The sapphire engagement ring you've been dreaming about is waiting for you here!